Aaron and I still have a lot of unpacking to do and won't be starting to paint very soon, but here are some pictures of the living room in the new house, the first room I have unpacked and organized... somewhat. When you come into the living room and look to the left this is what you see. There is a large window flanked by two built in bookshelves. 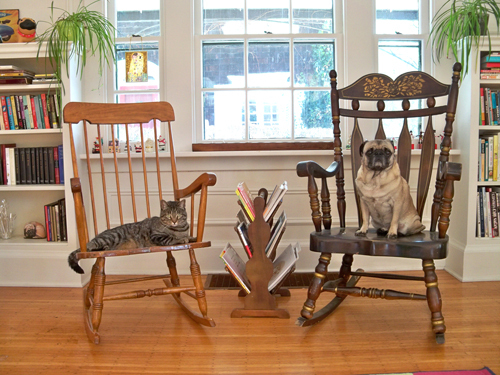 There is also a lazy cat and pug. I have included them in the shots for scale. Directly in front of you is a door out onto a patio and two windows. 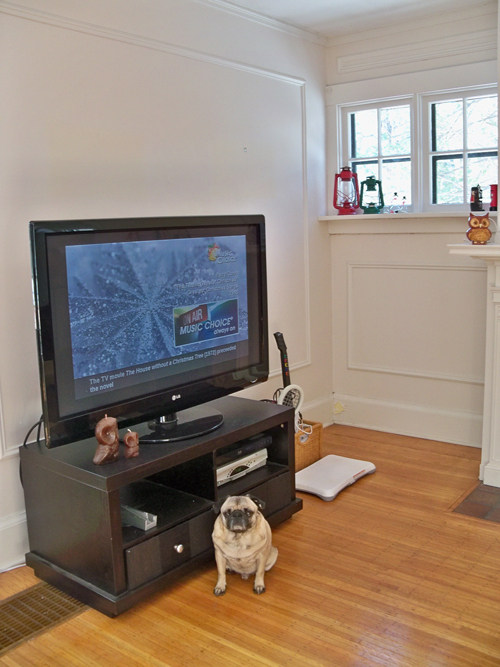 To the right is a fireplace... we put the tv on one side and the couch on the other. 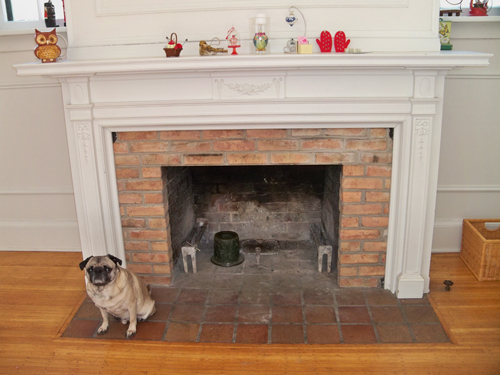 It's a brick wood burning fireplace with a wood mantle. There are two small window on either side of it. And the couch is what you see to the right of you when you come into the living room. So there is 360 degrees of the living room. I am thinking about painting it a light grey. Next up will be the dining room when I can get some shots in bright daylight - which is at a minimum these days. Very Nice! Love the architectural details! I love all of the windows. It looks like you will get some great light! Can't wait to see the paint color. I love built in bookshelves! Looks like a great house! All those pictures look like they came straight out of a decorating magazine! Lovely! What a great house...and it's ob vious your pets agree with us! Very pretty! I like the simplicity with the bright color accents. Your home looks great. Wishing you and your hubby many happy healthy years there. your living room is fantastic! i love all the light and color! Beautiful! The only word that came into my mind. Love the shelf with all the decorations. 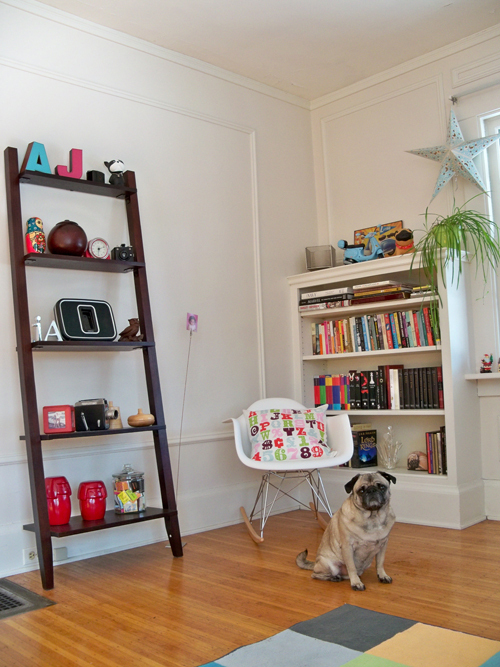 The little pug is quite the model; he is in almost every shot! I also love the built-in bookshelves, being married to a book lover. The fireplace gives your living room a cozy feel. Your adorable pug and cat can attest to that. Your choice of furniture is awesome! Very simple yet so elegant! You managed to keep your room spacious by choosing smaller items. Choosing smaller furniture can really make a room look less cluttered. Love those rocking chairs. Did you buy it in an antique shop? I agree with you H.P. Whether it's your living room or limited office space, choosing smaller furniture pieces make it less cluttered. You should also make sure that every inch of space is as functional as possible. 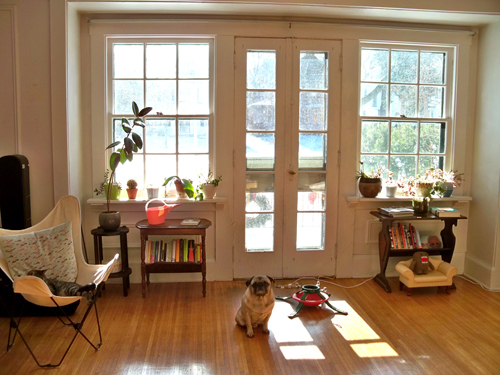 I like how you let sunlight in to your living room. 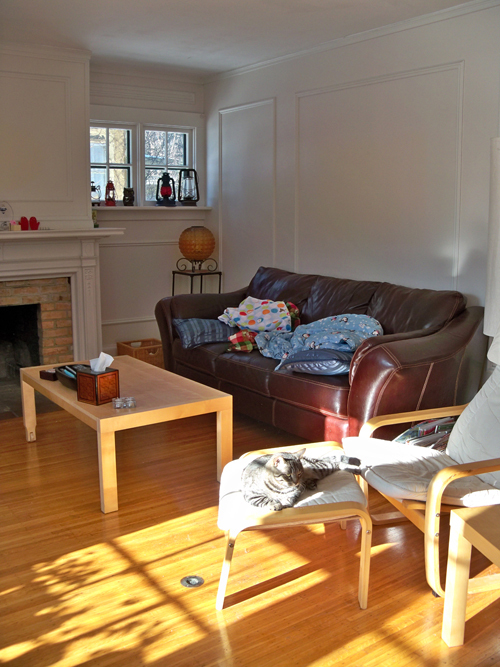 In our house, we choose to set shutters to provide privacy and allow daylight into the living room. Why not dress your living room windows with curtains, draperies or shutters? It'll look much better compared to bare windows. Just my two cents. I'd love to stay in a living room that looks like that. It's very refreshing and invigorating at the same time. A nice colored curtain will surely compliment well with the color of the wall. I also love your furniture. They must be made up of high quality screws and other industrial products to make them more intact and sturdy. This house looks gorgeous. If I were to construct my own house, I would like to have it constructed just like this one. The doors and walls are perfect. I will also ensure that wall cavities are installed well. I can say, this is one of the adorable house that I've seen. Very simple but elegant. The furniture and the interior designs are also fabulous! Great job on designing this house. Bedroom furniture is very important because this is the place that you can relax and have a good sleep. That living room looks lovely. I particularly enjoyed looking at those pictures because of your cute dog. 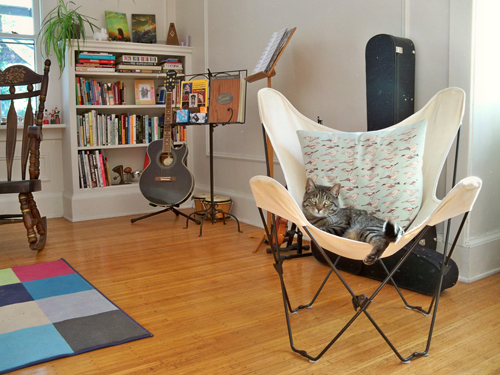 Renovating the house can be done with the right furnishings. Choose furniture that matches your home interior. Hi there, the decoration of the beds and rooms are beautiful....i came across a site which provides Cushion. They have a variety of pillows for room decoration.